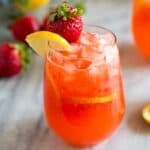 This easy Strawberry Lemonade recipe is my kid’s favorite summer drink. It’s homemade and requires just four basic ingredients! Out of all of the homemade drink recipes on my site, this lemonade recipe may be my personal favorite! My kids love to help me make it and squeeze the lemons. They also love helping me make Sparkling Mint Limeade and Easy Orange Julius. Many people grow up drinking powdered drinks. You know, like powdered lemonade, crystal light, or tang? 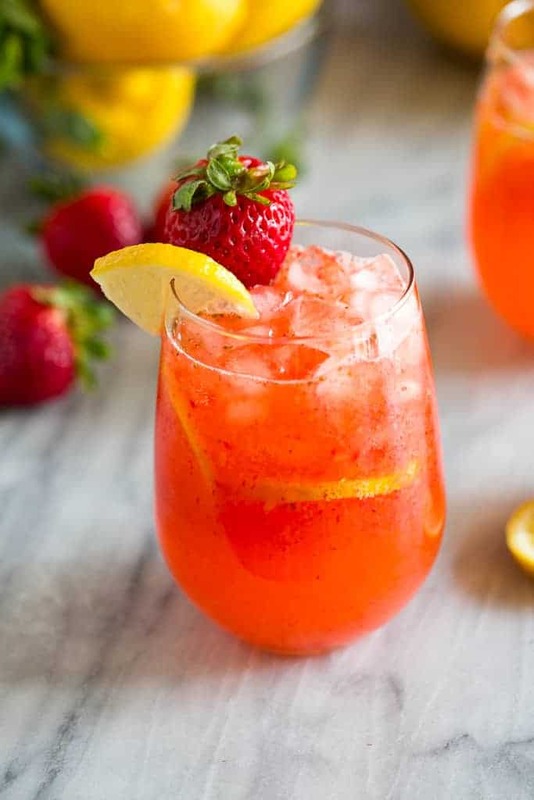 If these are the sort of drinks you are used to, this homemade strawberry lemonade is going to knock your socks off! It’s so fresh and delicious! The best part of this homemade lemonade recipe is how easy it is to make. You can even freeze the simple syrup and fresh-squeezed lemon juice so that making homemade lemonade is easy any time of year. Strawberries: Hull 1/2 lb of strawberries (cut the green stem off), and toss them in your food processor. Lemons: Fresh lemons are essential for this recipe to get that great fresh-squeezed lemonade taste. 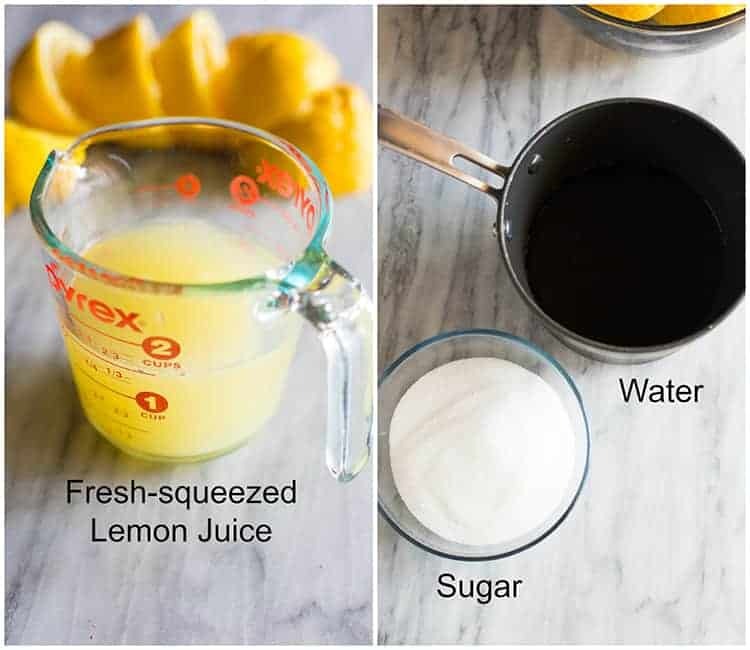 Depending on the size of your lemons, you will need between 6-8 medium size lemons to get 1 1/2 cups of lemon juice for this recipe. Sugar: White granulated sugar gets dissolved in water to create a simple syrup. Water: How much water you add depends on how sweet you like your lemonade. Puree the strawberries. 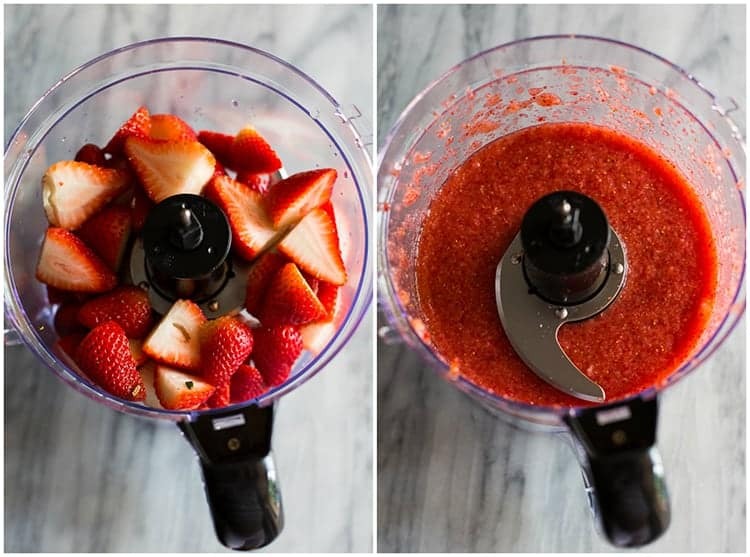 Use a blender or food processor to puree the strawberries. Strain them through a fine mesh sieve to remove seeds, if you want. Make a simple syrup. Add sugar and 2 cups of water to a saucepan. Bring to a simmer and stir until sugar is dissolved. Remove from heat and cool to room temperature. Juice your lemons. Strain the lemon juice through a fine mesh sieve into a pitcher. Combine syrup, lemon juice, and pureed strawberries. Stir to combine. Can you freeze fresh lemonade? Yes! You can freeze the lemon juice concentrate from this recipe and save it to make homemade lemonade, any time. 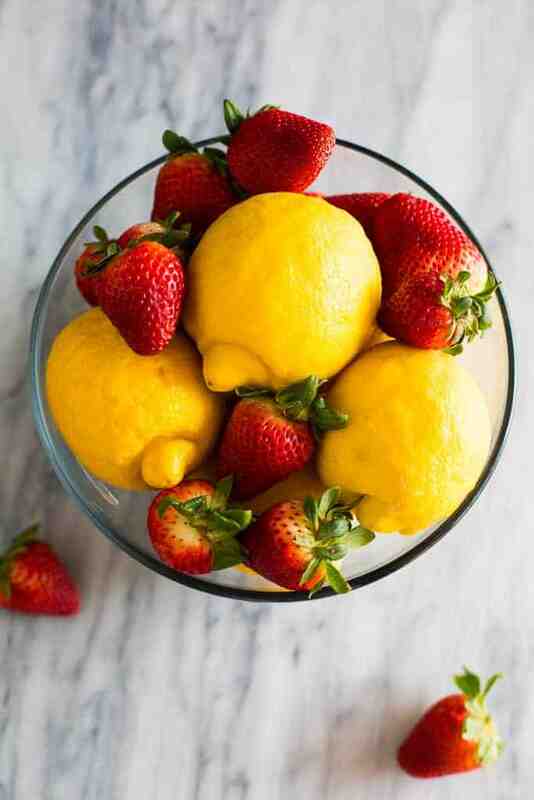 Mix the cooled simple syrup, fresh squeezed lemon juice, and pureed strawberries together. Pour into a freezer bag and freeze for up to 5 months. When ready to use, allow the mixture to thaw and add it to a pitcher. Add water, to taste, until you reach your desired sweetness. 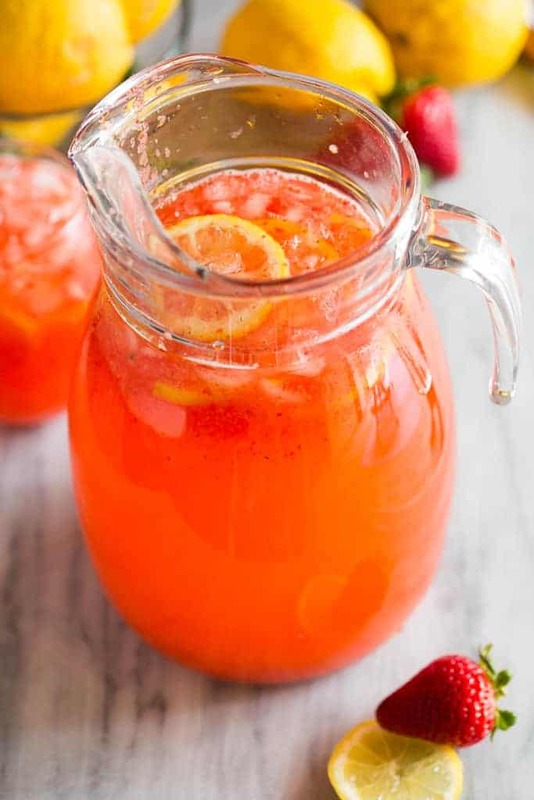 This easy Strawberry Lemonade recipe is my kids favorite fresh summer drink. It's homemade and requires just three basic ingredients! Use a blender or food processor to puree the strawberries. Strain them through a fine mesh sieve, if desired, to remove seeds. In a small saucepan, over medium heat, stir together sugar and 2 cups water. Bring to a boil, and stir until sugar is dissolved. Remove from heat and allow to cool to room temperature. Strain the lemon juice through a fine-mesh sieve into a 2-quart pitcher. Add simple syrup and pureed strawberries and stir to combine. Refrigerate until cold. This is so refreshing.I did not have a mesh sieve. I used juicer for lemons. I suggest diluting with more water.